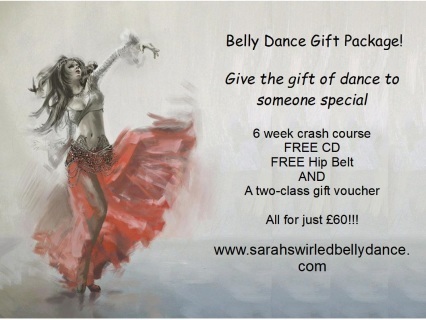 I am now offering a fabulous gift package suitable for any occasion. All this for just £60!! For details of the Crash Course dates, please follow the link. 2) Please provide your preferred choice of colour for the hip belt. Sarah Swirled will try their best to accommodate this, but will get in touch if unable to comply. 5) In the event that the recipient is unable to attend the Crash Course for any reason during 2018 a refund of £25 will be given or the voucher can be tied over to the following year. It is the recipients responsibility to contact Sarah Swirled to arrange either refund or carry over. 6) If Sarah Swirled is unable to provide a suitable Crash Course a refund of £30 will be given. 7) CD's may differ to that shown in the picture, but will not the same as the one given on the Crash Course. 8) Gift boxes may vary. Should you have any questions about this, please contact me.